Sergejus Fedotovas has said refereeing standards must rise and match officials have to publicly explain decisions. Hearts have issued a strongly worded statement criticising refereeing standards and calling for changes to be made to the current disciplinary system. The club has suggested that referees should be made to speak to the media after matches and has called for sanctions against officials who act “deceptively”. 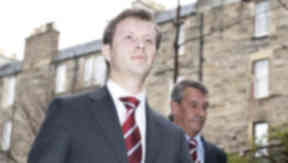 In the wake of controversy surrounding penalty decisions involving Celtic matches in the last two weeks, Hearts director Sergejus Fedotovas has suggested that matches involving the Old Firm are more closely scrutinised and has called for changes to be made to ensure consistency and minimise any suggestion of bias. Ina a statement released through Hearts’ official website, Fedotovas said: I would not like to comment on any specific situation in the game in Scotland, but I would like to suggest that the refereeing standards need to go up significantly. Scottish football’s refereeing system has been under the spotlight in recent weeks and though Dougie McDonald’s controversial penalty reversal at Tannadice was backed by the SFA, the body warned the referee over inconsistency in his reporting of the incident. Assistant referee Steven Craven resigned following the incident and has heavily criticised the SFA and referee’s chief Hugh Dallas in a newspaper interview. Fedotovas has said that every club, and every match, has to be treated the same and said that all football fans will have been worried by the reports that McDonald had altered his version of events. “There should be no double standards - all clubs need to be treated equally, not just those that dominate the game,”he said. “I do not remember any other situation where referees have been so strictly cautioned when it involved any other club outside the Old Firm. Regan revealed in an interview that he planned a thorough review of disciplinary procedures.